I thought it would be interesting to try creating Samurai puzzles with gaps in, but to do this not just by creating an enormous puzzle but by putting gaps actually into the underlying Sudoku grids, so some rows and columns are incomplete. 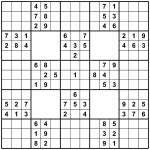 Take a look at the 6×9 puzzle attached (”2-grid 6×6 Samurai Gap puzzle”). Can you place 1 to 6 into each unbroken row and each bold-lined 2×3 box, whilst placing 1 to 6 into the top 6 and bottom 6 squares in each unbroken column? In other words, there are no rows or columns where there is a gap in the puzzle – you can repeat numbers on opposite sides of the gap. This smaller puzzle is actually very easy, so I tried making a larger one with four 3×3 boxes ‘punched out’ of the puzzle. Again, where rows/columns run across the gaps then there are no restrictions on numbers repeating. Everywhere you find a continuous run of 9 squares from a bold line to a bold line in a row or a column then you must place all of 1-9 into that region. Also all of the 3×3 bold-lined boxes must contain 1 to 9 as usual. Where a run of squares reaches a blank area then there are NO restrictions on that run – rows or columns don’t run across the gaps, in other words. Incidentally, it would be perfectly reasonable for the rows/columns to continue across the gaps, but they don’t in these two puzzles – maybe they will in tomorrow’s puzzle! (it’s the obvious thing to change after all). This entry was posted by Gareth Moore on April 11, 2009, and is filed under Gap Sudoku, Samurai, Samurai Variants, Sudoku, Sudoku Variants. Follow any responses to this post through RSS 2.0. You can leave a response or trackback from your own site. This one was a yawner for me. One of the strategies in my sudoku arsenal is to scan and finish 3 consecutive regions, and this was a march around the puzzle doing that. I understand that this was a setup for the next puzzle though.